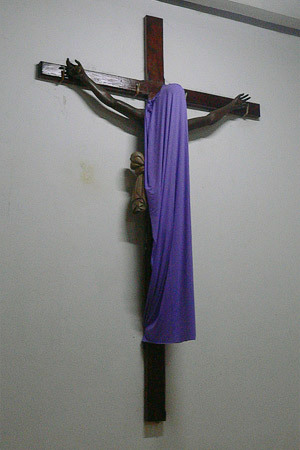 As is known, Holy (Passion) Week, during which all Christians recollect such important events of the Gospel as the Lord's Supper, commend to trial, suffering, crucifixion and burial of Jesus Christ, is for Catholics, along with Christmas, the most important event in the religious calendar. In the Catholic tradition, the most important and cherished days (Maundy Thursday, Good Friday and Holy Saturday) are united under the name Easter Triduum (Triduo Pascual) and characterized by the most dramatic, colorful and filled with deep religious meaning and mysticism actions. I think that many people know, that the essence of the celebration of the Holy Week in the Spanish-speaking countries are grand processions, lasting all week, starting with the Palm Sunday and ending on Saturday before Easter. 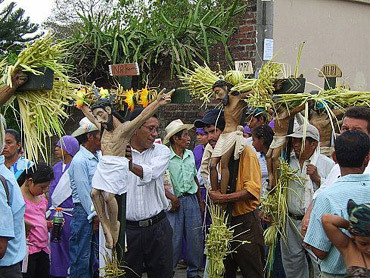 In Latin America, the tradition of processions, inherited from the Spanish conquerors, with passage of time and under the influence of local religious beliefs and practices, have modified and acquired its own unique, original features in each country. 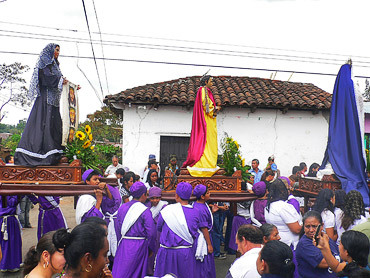 In El Salvador the most colorful and memorable processions are held in the department of Sonsonate, in the town of Izalco, which at the time of the Easter holidays, becomes a tourist center and a place of global pilgrimage. 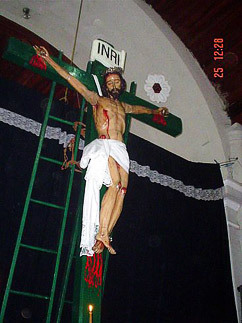 Decoration of churches Nuestra Señora De Los Dolores and Nuestra Señora De La Asuncion, Izalco, Sonsonate. 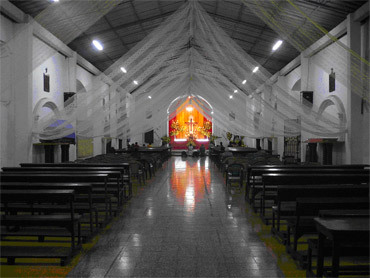 Traditionally, preparation for the celebration starts with the decoration of the main altar of the church, in the center of which invariably there is a cross - the main character during the entire Holy Week. It is also customary to cover all images of saints that are in the church with bedcovers. There are several explanations for this. The most superstitious parishioners claim that in such a way they protect relics from the evil force that comes into this world in absence of Christ (cannot help but thinking of Voland and his retinue from the famous novel). 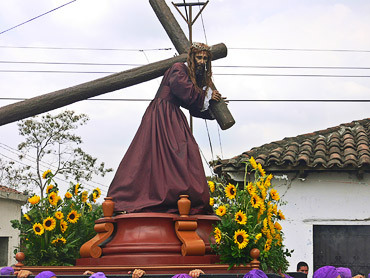 Others believe that in such a way the attention of believers is focused on the altar that contributes to reflection on the content and meaning of the events of the Holy Week. And they both agree that in such a way the historic "reference point" of Christianity is being recreated. 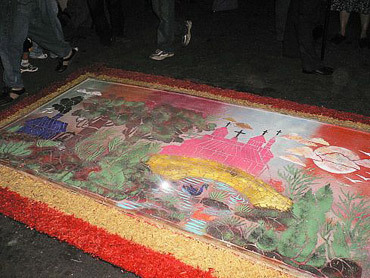 In addition, in El Salvador there still remains the custom to decorate the streets with special floor mats - a tradition that is almost outdated in Central America. 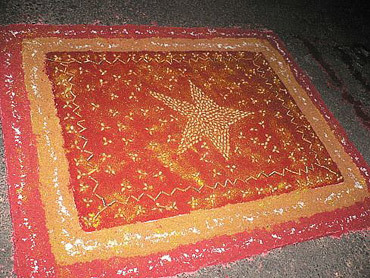 As a rule, these mats are made from regular table salt, which is painted by mashed paint. Subject of these mats is various: from Biblical stories and symbols to Disney cartoons - all depends on imagination and abilities of the artist. Any locally available materials are used for decoration of mats - sawdust, flowers (especially the ears of coyol), multi-colored buttons, and even ... macaroni. In 2010, the city administration of Izalco established a contest for the most original mat: the winner will get a certificate and a cash prize of $ 100 (USA). Starting with the Great Monday the whole town seems to transform into a huge theater, where expands a stunning in its depth and intensity of passion drama, in which the streets of Izalco become natural scenery. 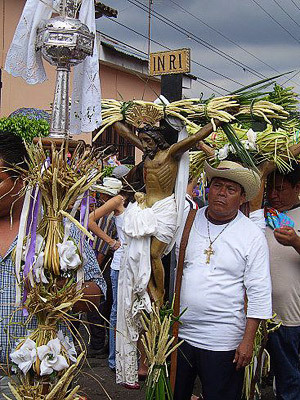 Perhaps the main feature of the processions in Izalco (except the fact that local traditions are officially recognized as the most ancient of all El Salvador), is their amazing realism and that dedication, with which local residents commit themselves to acting. Everyone participates in different way, according to its strength and abilities. 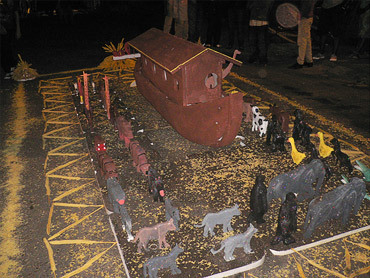 In the city there are religious brotherhoods, whose task is to organize processions and vigils. They set altars as per special agreements in private houses, near which the processions stop for the mandatory reading of religious texts and singing of anthems. 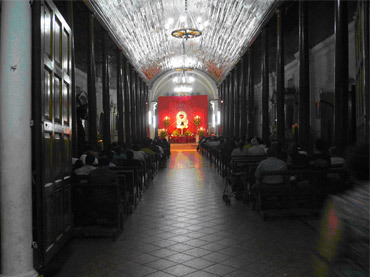 Many residents of Izalco offer their houses for rest of those who carry platforms with images of saints, while others are preparing clothes for images; others donate food for preparation of traditional for this season dishes, which are distributed by the brotherhood to all who wish during the night vigils. The most important processions fall in the Easter Triduum (Triduo Pascual) days. 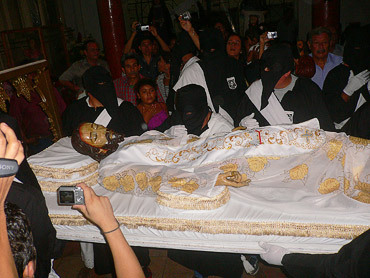 On Holy Thursday a unique procession – a blend of Christian and Indian traditions – can be observed in Izalco. Especially for participation in this solemn procession, which is called Procesion de los Cristos, the elders of the Indian communities, each of which presents its own relic (some crucifixes were made in the XVI-XVII centuries) decorated with special marks of distinction, get together. 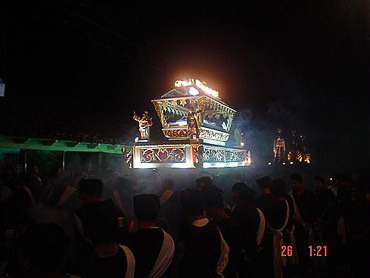 Interestingly, in this procession the image of San Nicolasito takes part, enjoying the special honor of the Indian population. Additionally, this is the longest procession that lasts all night, from Thursday night through Friday morning (totally of about 17-18 hours). On Thursday night there comes another, no less interesting procession – Procesión del Silencio, a characteristic feature of which is the absolute silence (the rest of the processions are accompanied by singing, banging of drums, rattles). 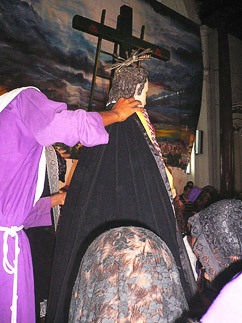 Holy Friday, the most mournful day in the Christian calendar begins with sacred procession, during which there recreates a scene of the last meeting of Christ with Virgin Mary and Veronica (platforms are brought close to each other, and Veronica, by means of a special mechanism, unwraps the canvas with a Savior). 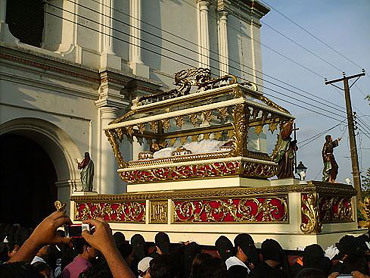 At midday the procession enters the church of Dolores with installed cross, on which the symbolic act of crucifixion accompanied by the mournful funeral hymn "Perdón y piedad" is performed. Upon termination actions of the saints, who will "go" in a funeral procession, get dressed in the mourning clothes. On Friday night the body of the Lord is removed from the cross – there begins the main procession of the Holy Sepulchre, which passes through all the streets of the city. The procession ends early morning on Saturday. During the procession the choir performs the hymns of the Passion of Christ. 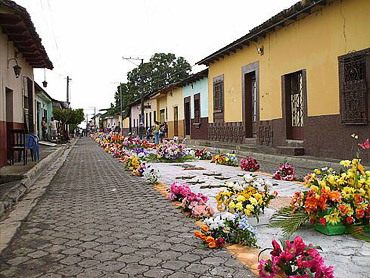 On Great Saturday it is customary to observe a universal mourning: on this day in Izalco you won’t hear music, loud conversations, the dominant color in the clothes is black. In the evening the last procession goes out, only with the image of Virgen de la Soledad, invariably decorated with white lilies. This procession is mostly accompanied by women. We should also say a few words about some of the images involved in these processions. 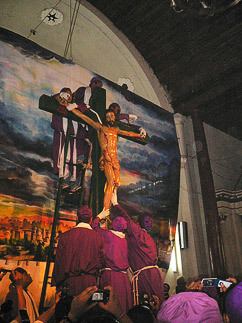 The most ancient and respected are Jesús Nazareno and Jesús de las Once. 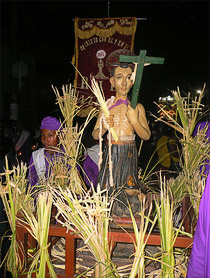 These images are solely made for participation in the processions of Holy Week. Rest of the time, they are kept in special storage facilities and are not exposed for a review of the public. 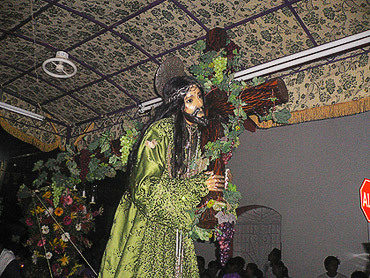 According to a legend, the image of Jesús Nazareno was found in the river Chiquihuat, runnig in the outskirts of Izalco; it is thought that this is why holy water oozes from the walls of the store where the image is kept. The image is thought to be miraculous: a special honor is to sacrifice your own attire, for which people have to take their turn several years in advance. During the procession, you can also see that the fingers of the statue are entirely studded with rings, chains and pendants - gifts that are presented in gratitude for the miracle. The platform of this image is provided with a special mechanism - during the procession the image turns in different directions to bless the houses, in the doors of which the believers (so-called presentaciones) are standing. Jesús de las Once received its unusual name from the existing earlier tradition to start a Holy Friday procession at exactly 11 o'clock. An interesting feature of this image is that it is different from other Latin American images of Christ, for which the majority of typical Indian features (dark skin, black hair, high cheekbones, etc) are distinctive. Because of the light-colored skin and hair of the pictures, it was believed for a long time that Jesús de las Once was made and brought by the first conquistadors from Europe, although, there are no documentary evidence of this. Strange as it may seem, but the greatest holiday in Christianity, the Resurrection of Christ, is not celebrated with such pomp and solemnity as, say, in Orthodoxy (for example, there is no special Passover meal or Easter greetings). Easter Vigil takes place in the evening of Holy Saturday. In front of the temple a fire is made, from which the priest lights up a large Easter candle, Paschalis, and enters the temple, proclaiming “Light of Christ”. Believers in the church light their candles from that Paschalis. On Sunday evening in parks they hold concerts, during which festive hymns are performed.